Truth be told, every research work should be conducted on a documentation basis at all times. My last adventure reporting the presence of 70 mm in my hometown, published in this site, however, had little or non-existent documents to rely upon. Not even the projectionists or exhibitors unions had files on installation venues, let alone information about projection booths. The result was that I had to rely on my own memory and on the memory of others, which is bad, from a research point of view. However, I had recent access to images from newspaper files available to the general public over the Internet. These are microfilm or plain paper scanning of the pages in consecutive, albeit limited, years of publication. I then decided to do a new investigation on two of the papers available, and these are the Ultima Hora (1965 to 1969) and the Jornal do Brasil (1965-1971), nicknamed “JB” by the students during my high school years. These are the only newspapers from Rio that I could find. Some of their pages are missing or unreadable. Nevertheless I could manage to make some approximate, or in some cases exact, calculations about film releases and theatrical openings. To achieve reliable info I had to search each and every Monday editions from the planned time span. On those days, theatrical openings and advertising were normally due on Mondays, and eventually on Thursdays or weekends. Why 1965 to 1971, you might ask? Because 1965 was the year that 70 mm film presentation saw the light of day in a theatre on these shores, not to mention that on October 20th 1967 the Roxy theatre opened for “Super Cinerama”, this being the most important theatrical achievement of the 1960’s. Up to that point Cinerama only existed at the Comodoro in São Paulo, which, by the way, was also converted to Cinerama 70. Up to 1971 most 70 mm venues were running 70 mm feature films, sometimes on a weekly basis. Many of them were showing the same picture for more than 20 weeks in a roll. The very sentence “70 mm” was reason enough for audiences to crowd the theaters incessantly. Much more to the credit, I suspect, than the “6-track stereophonic sound” announcement in the adverts. So much so that it came to a point that some advertising were displaying a banner saying “Filmed in 70 mm” on 35 mm regular screenings. On a side note, advertising was constantly misleading. Previous to 70 mm presentation a number of films were reported as 6-track stereo sound, but these were 35 mm scope prints from 70 mm features, which were physically limited to 4-channel stereo. 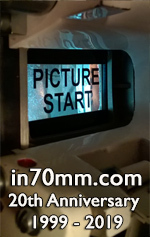 The notation of 70 mm was constantly printed as “70 m/m”, which is not a correct specification format in the metric system. Until today I am not sure what “Super Cinerama” means. Surely, it was not a new photographic process. It could have been related to the way the screen was installed, from the floor to the ceiling, occupying a space much later than the original front stage. Apart from Rio de Janeiro and São Paulo, there are reports of a 70 mm “Super Cinerama” installation with Victoria X projectors, with possibly Dimension-150 lenses, on a 146º curvature screen, at the Cine Londrina, located in city of the same name, in the state of Paraná. And once more, the term “Super” is restricted to the press fanfare, not to the front of the theatre, which, like the Roxy, only says “Cinerama”, and in this case without the logo. 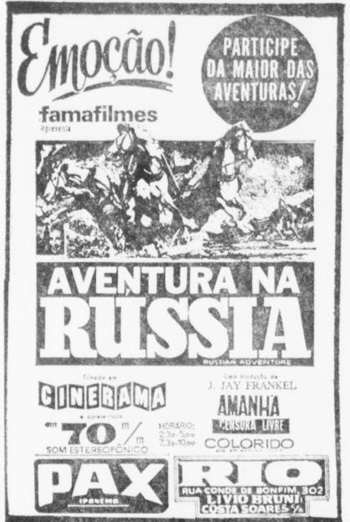 The Londrina, by the way, ran 70 mm pictures from 1968-1974, closing down permanently. One week later, the Palácio was screening "Sound of Music" in 35 mm CinemaScope. Both pictures ran for a staggering and unprecedented 21 weeks of exhibition. "Sound of Music" would re-run at the Roxy in 70 mm on December 23rd 1971. The so-called “Super Cinerama” at the Roxy was first exhibited to the public on October 20th 1967. And the advert published in the papers was saying that it was for the first time that a Cinerama screen could be seen by the public in this town, and it was true. The first picture in Super Cinerama, "Battle of the Bulge", was in fact shot in Ultra Panavision 70 anamorphic. Therefore, a print for a 2.75:1 aspect ratio could be projected correctly on an ultra large screen. In the presentation the credits for Cinerama (as a company) is displayed. The Roxy theatre was originally built around the corner at the crossing of Bolivar Street and Nossa Senhora de Copacabana Avenue. The Cinerama logo was ostensibly displayed at the Nossa Senhora de Copacabana side, built at the top of its side marquee. In later years this logo would be removed and the advertised logo in the papers for the same screen would disappear too. From September to mid-October of 1967 there is no newspaper advertising for the Roxy. Presumably the technicians and Orion de Faria were refurbishing it to complete the Cinerama with a curved screen. The actual opening for permanent operations was likely due on October 21st, one day after it was advertised in the papers. Orion told me that they had problems with one of the lenses, which might explain the one day delay in the opening. At any rate, although the highly curved and tall screen was brand new technology to everyone involved in this installation, the theater itself was fully operational from day one, with perfect projection and sound. Of equal importance released to film buffs, on February 3rd 1969 “Shoes of the Fisherman” was already in its second week of presentation at the Metro-Boavista, which presumably inaugurated its Dimension-150 installation the week before or earlier. The projection in Dimension 150 was the second, highly curved screen for 70 mm picture that I saw. The Metro-Boavista replaced the Metro-Passeio which was demolished years before. The design of the hall was superlative. The screen had an internal framing that would adjust its aspect ratio to almost any known film format, including regular 35 mm CinemaScope/Panavision films. For Dimension 150, a wider and taller screen would open up completely, yielding a compelling and more involving projection system that I had ever seen. The Metro-Boavista was built from scratch with that purpose in its design. A pair of Cinemeccanica Victoria-8 projectors were used, according to one of my sources years ago. For some reason the Dimension 150 logo was removed from the advertising some time later. The opening credits for “A Projection In Dimension 150” was also later discarded. A number of films that weren’t even shot in Dimension 150 or 70 mm, for that matter, were exhibited in this system, as the advert on September 11th 1969 for "Dr. Zhivago" shows. Previous 3-strip Cinerama features would turn up on the Dimension 150 screen, and one such example is "How The West Was Won", running on July 2nd 1970. The 70 mm craze had no perceivable boundaries. Feature films shot in the ancient academy ratio by M-G-M, like "The Great Caruso", were now exhibited “in 70 mm and full stereophonic sound” (February 19th 1971). According to the IMDb a 70 mm blown-up print was struck in 1967. According to film preservationists the practice of blowing up to 70 mm from original camera negatives led to their destruction. One such case was the 70 mm print for "Seven Brides For Seven Brothers", whose exhibition was on in November 1968. I had the chance to see "Seven Brides" when the Rio theater was installing its alleged Todd-AO screen. It was simply gorgeous. Unlike its academy ratio predecessors, the aspect ratio adjustment was less drastic and the sound mixing adequate for the 70 mm speaker pattern. “Half-A-Sixpence” from Paramount would open the Bruni-Flamengo and Bruni-Tijuca 70 mm installations, but only the latter had 70 mm built from scratch prior to its inauguration. This theater was actually installed by Orion de Faria with his Incol 70/35 projectors, opening on August 26th 1968. Most 70 mm features were either North-American or British made. Eventually, however, there were presentations from other countries. The Condor Largo do Machado theater, for example, was refurbished and re-inaugurated on October 14th 1968, with Jacque Tati’s brand new copy of "Play Time". Brazilian film production had its own share of 70 mm presentations. “Quelé do Pajeú”, directed by Palme D’Or winning film maker/actor Anselmo Duarte, was actually shot in 70 mm, and one of his later features “Um Certo Capitão Rodrigo” blown-up to Cinerama. “Cleo e Daniel”, directed by Roberto Freire was also shown in 70 mm. At this point it must be noted that the Roxy was not open to any other format than 70 mm. I recall vividly that the press reported that the Roxy screen was “too curved” for regular 35 mm feature films, but according to Orion de Faria this was not true. He said to me that he was ordered by the exhibitor to remove the 35 mm parts from his projectors, so that it would be impossible to screen 35 mm of anything. And in fact, I remember all trailers preceding features being exhibited solely from 70 mm prints. This being the case, any Brazilian production would have to be printed in the 70 mm format or else, and that would eventually restrict the obligatory screening of Brazilian films at the Roxy for a long period of time. On October 27th 1970, Orion de Faria had just finished installing a new pair of his Incol 70/35 projectors at the Rian theater. The exhibitor settled for a 70 mm print of “Woodstock”, a documentary popular with people of my age back then. The Rian was a beautiful theater, splendidly located at the Copacabana seaside. When the print arrived there, a surprise: it was a scope 35 mm print. Orion and the exhibitor’s technician had to change plans quickly. They worked overnight so that the opening date could be kept. The final adjustments were made early in the morning, he said. Still, the advertisement would claim a “6-track stereophonic sound” that was not going to be. The “70 m/m” notice, however, was lost from the advert in the nick of time. “Patton”, on the other hand, shot by Franklin Schaffner in Dimension 150, was exhibited in regular 70 mm, at the theater next door, the Palácio. The advertisement could only state that it was “Filmed in Dimension 150”. No one of us would know the difference anyway, except that Dimension 150 would be a curved screen process similar to Cinerama 70. It seems to me until today that 70 mm projection systems were the real revolution in film presentation ever produced, be it curved and tall or regular “flat” screens. Its magnetic sound was superior to CinemaScope and the picture brighter and infinitely less distorted optically and with the best photographic resolution that can be achieved with stock film. It is true that digital is getting there, but no one that has experienced Cinerama 70 or Dimension 150 or similar, in large theaters, will never get the same visual feeling with today’s material. I myself experienced IMAX in its digital format, I can peacefully acknowledge that it is great, but the screen format, taller than larger, is not, in any way, superior to 70 mm Cinerama. As far as I am concerned, my greatest Cinerama experience as an adolescent, one that perhaps led me to believe that science-fiction would eventually be true science at the turn of the century, was Arthur Clarke and Kubrick’s “2001, A Space Odyssey”. It opened in Cinerama 70 at the Roxy on July 24th 1968. It was the most remarkable film presentation ever, one that will stay in my memory for the rest of my life. I would like to express my sincere appreciation and gratitude to in70mm reader João Carlos Reis Pinto, for sending to me the link to the Ultima Hora newspaper scannings, which allowed me to start this new research.